Status: Uncommon regular summer visitor Panhandle, rare casual elsewhere. Rare casual breeder Panhandle. Rare casual winter visitor statewide. Documentation: Photograph: 20 May 1984 Monroe Canyon, Sioux Co (Swanson 1984, Williams, 1984). Taxonomy: Of five recognized subspecies, two breed north of Mexico: “eastern” psaltria, breeding and wintering from eastern Colorado and western Oklahoma south to Guerrero, Oaxaca, and central Veracruz in southern Mexico (northern populations are partly migratory), and “western” hesperophilus, breeding and wintering from southwest Washington east to northeast Utah and south to Baja California Sur and southern Sonora (Watt and Willoughby 2014). Recent opinion maintains the two traditional (AOU 1957) subspecies while noting that “most” western males (hesperophilus) have green backs, and “most” eastern males (psaltria) have black backs (females do not differ in coloration), and that the color types exhibit “markedly different” molt and breeding phenologies (Willoughby 2007, Watt and Willoughby 2014). The Rocky Mountains and Sierra Madre Occidental constitute a region of clinal transition between the two subspecies in the United States (Watt and Willoughby 2014). Farther east, into Colorado, New Mexico, and Texas, an increasing percentage of males have the dorsum and auriculars black and the ventrum brighter yellow (Watt and Willoughby 2014). Taxonomic confusion can largely be attributed to the fact that the type specimen of nominate psaltria happens to be a green-backed male from Colorado, where black-backed males are presumed to be more numerous (Watt and Willoughby 2014). In Nebraska, Kansas, and South Dakota, black-backed and green-backed males occur in roughly equal numbers (Tallman et al 2002, Thompson et al 2011), with perhaps slightly more black-backed males reported in Nebraska (13 of 23). Changes since 2000: The first state record was in 1984, but of numerous records since then only six were prior to 2000. 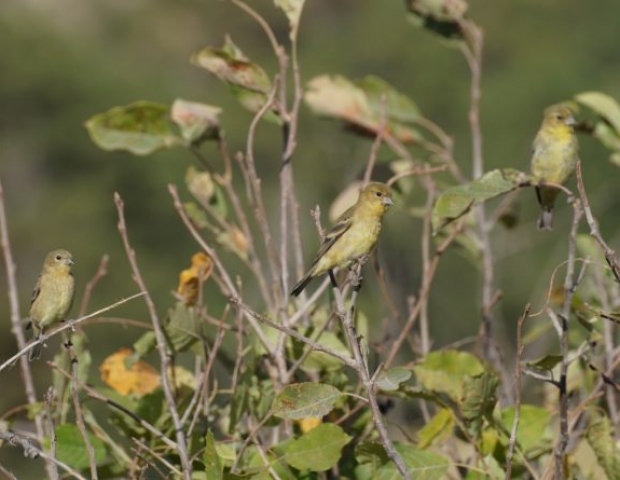 The species is expanding its range northward in eastern Colorado and continues to increase its numbers in Nebraska; 45 were banded at Wildcat Hills NC, Scotts Bluff Co Sep-10 Oct 2011 and 96 were counted there 26 Aug-8 Oct 2015. Recent breeding records and increased sightings indicate the species is rapidly establishing itself as a summer resident in the Wildcat Hills. We expect the species will continue to increase in numbers and expand its range in western Nebraska. There are earlier spring arrival dates 15 Mar 2008 Scotts Bluff Co, 1 Apr 2015 photographed Lake McConaughy, Keith Co, 28 Apr 2008 Morrill, Scotts Bluff Co, and 8-9 May 2011 Wind Springs Ranch, Sioux Co. Later fall dates are 18 Oct 2008 Scotts Bluff Co and 21 Oct 2018 Wildcat Hills NC, Scotts Bluff Co. The only reports east of the Panhandle are of a black-backed male photographed in Elkhorn, Douglas Co 20-21 May 2009 (Brogie 2009) and one at Lake Ogallala, Keith Co 4 Jun 1998 (Brown and Brown 2001), although there are three reports east of the core range from Crescent Lake NWR, Garden Co 25 May-9 Jun 2008, 12 Jun 2009, and one photographed 27-29 May 2010 (Brogie 2011). 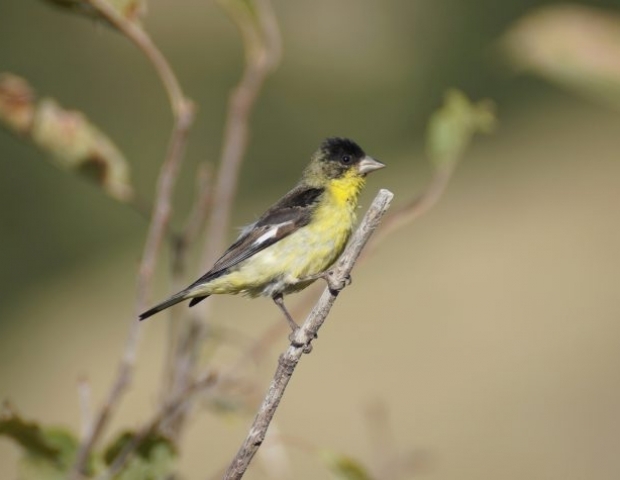 The first Nebraska record of Lesser Goldfinch was as recent as 1984, apparently part of a northward expansion along the foothills of eastern Colorado. There were two more records until 1998, and since then reports have been annual except for 2001-2003. The first three records were 20 May 1984 (cited above), 1 Jun-7 Jul 1986 Crawford, Dawes Co (Cortelyou 1986, Mollhoff 1987), and 9 Jul 1988 Carter Canyon, Scotts Bluff Co (Kenitz 1988). Numbers remained low until 2008, when the six reports totaling 17 birds were described as “an amazing showing” (Silcock 2008). Since 2008, numbers have increased rapidly throughout the western Panhandle; 45 were banded at Wildcat Hills NC Sep-10 Oct 2011, and 96 there 26 Aug-8 Oct 2015. Some evidence of northward expansion was provided by two reports in 2017 and one in 2018: four were reported at a Chadron, Dawes Co feeder 8 Jun 2018, two were well-studied in Harrison, Sioux Co 21 Aug 2017and a green-backed male and female were photographed at Fort Robinson, Dawes Co 3-4 Aug 2017. Nebraska’s first breeding record was of an adult pair apparently feeding at least one young bird inside a bush at Wright’s Gap, northeast Banner Co, 19 Jun 2010; the young bird was not visible but could be heard “cheeping”. At this same location in 2007, a pair was accompanied by an apparent begging juvenile capable of flight, indicating it could have been hatched somewhere else. 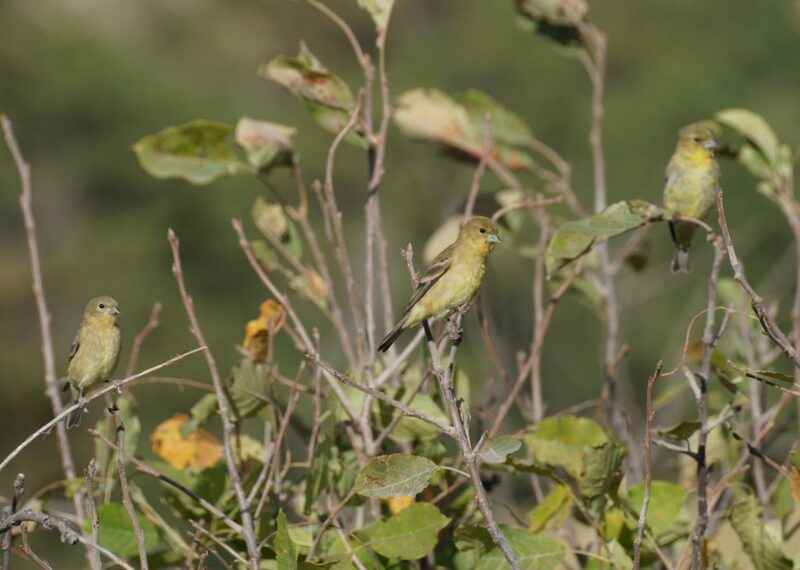 In 2014 two males and a non-flight-capable fledgling were in Carter Canyon 23 Aug in an area where the species had been observed in previous years. A female “still in breeding condition” was banded at Wildcat Hills NC 26 Aug 2015. Winter: The four accepted records are scattered across the state. In the west, a male was at a Scottsbluff, Scotts Bluff Co feeder 19 Feb 2008, and one was reported without details at a Morrill, Scotts Bluff Co feeder 13 Jan 2002 by an experienced observer. One in a Lincoln Co yard 18 Jan-17 Feb 2018 was photographed. An extraordinary record, both for location and date, was of a green-backed male photographed attending a Murray, Cass Co feeder from around 26 Nov 2016 through 14 Jan 2017. Perhaps even more extraordinary, almost certainly the same bird returned 6 Nov 2017, but the saga continued as this bird was with Pine Siskins at the same feeder 4-7 May 2018. A bird with a black cap and greenish back “probably” this species was near Gibbon, Buffalo Co 16 Nov 1996 (Silcock 1996). In recent years (1995-2012), the breeding range has expanded north, with overwintering now occurring in Colorado (Willoughby and Watt 2014), suggesting that more such records might be expected in Nebraska. There are two winter records for Wyoming, in 2006-2007 and Dec 2007 (Faulkner 2010). Kenitz, A. 1988. Lesser Goldfinch in Scotts Bluff County. NBR 56: 82-83. Silcock, W.R. 1996. Fall Field Report, August-November 1996. NBR 64: 106-129. Swanson, P. 1984. 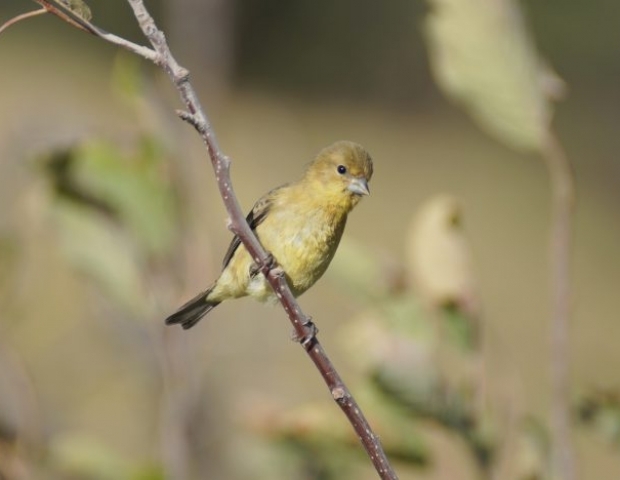 Lesser Goldfinch reported in Nebraska. NBR 52: 42. Watt, D.J., and E.J. Willoughby. 2014. Lesser Goldfinch (Spinus psaltria), version 2.0. in The Birds of North America (A. F. Poole, Editor). Cornell Lab of Ornithology, Ithaca, New York, USA. https://doi.org/10.2173/bna.392. Willoughby, E. J. 2007. Geographic variation in color, measurements, and molt of the Lesser Goldfinch in North America does not support subspecific designation. Condor 109: 419-436.